Michael “SIC MIC” Siczynski began his “official” musical trip in Poland at the prestigious Jerzy Kurczewski Choir in the early 80’s, where he learned music theory, playing piano and singing. As a young teenager he realized though that the drums were more fun and so the never-ending process of taming the beast has begun. Michael’s focus has always been on the groove and togetherness of the band and he was fortunate to have a chance to play with more experienced musicians than himself from the very early stages of his drumming career. 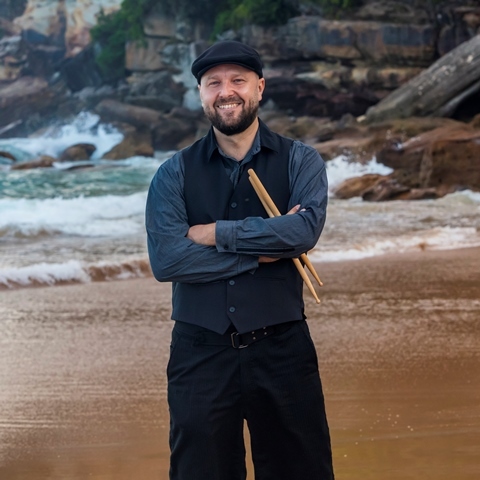 As a mostly self-taught drummer Michael has played with many original and cover bands back in Poland and continued his musical adventure after arriving in Australia in 2003. Joining Kotahi Groove in 2016 has been a great opportunity (and pleasure) for SIC MIC to continue his musical trip with a group of great musicians, singers and friends playing the groovy music they all love.